Oh I wish Jason Richardson’s 3pt would have beaten Kansas, we would have gotten to see more of the man, Stephen Curry. 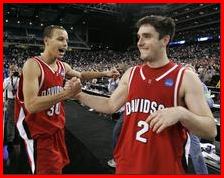 His performance and that of Davidson has made this year’s NCAA tournament special. 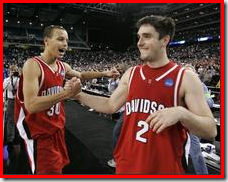 It’s amazing that Curry was not recruited by ACC schools coming out of college. The guy is Dell Curry’s son, for pete sakes, did anyone in the ACC ever see Dell play and didn’t see the similarities in Stephen? There is a reason Dell was able to play 16 years in the NBA, the guy was slow, but could shoot the lights out. Great shooters are so rare. Watching his son school the likes of Georgetown, Wisconsin, and Kansas was priceless. Oh well, on a bragging note, I did pick the final four in my bracket and have a fighting chance to win our pool . I grew up and still live in Cincinnati. I grew up in the days of the Ickey Shuffle and the blond bomber Boomer Esiason so needless to say I’m a Bengals fan. Here is my impressions after watching last nights game against the New England Patriots. Our safety’s, Dexter Jackson and Madieu Williams are undersized and unwilling to play tough against the run. Williams was man handled against Sammy Morris in the open field. We need a tight end. Some teams have really good DB’s that match up well against our wide receivers, those teams typically don’t have good enough linebackers to stay with a productive tight end. The Bengals need to diversify their offense, starting with a tight end who can make the 3rd and 5 catch. David Pollack – 1st round, career ending injury. Kenny Irons – 2nd round, torn ACL. Chris Perry 1st round – broken leg. Dennis Weathersby – 4th round – career ending auto accident. I think Marin Lewis is a good football guy, not the best situational coach but a good motivator and understands the game. In the end he is still hampered by the owner, Mike Brown, and his unwillingness to run the Bengals like the other NFL teams (minus Buffalo of course). The Bengals organization still does things like the days of the Ickey Shuffle and until that changes mediocrity is the best this team is going to do. I’m huge sports fan, so much that I’m thinking of spinning off a new blog about sports since the TechToolBlog is not the right spot for these rants, but this 1st post is going up here. Last night I watched the Chicago Bulls vs Detriot Pistons. I’m a Bulls fan (I grew up in Jordan’s hay day) so I have a rooting interest till this day in the Bulls. Watching the second half, three things became painfully clear for what Chicago needs to do to overtake the Pistons in the Eastern Conference. Chicago needs a big man who can score….bad. Ben Wallace is a great defender but doesn’t come into the conversation when offense is involved. P.J. Brown is a stop gap and isn’t close to an answer. Scott Sciles needs to play Tyrus Thomas a lot more, he is the closet thing they have and they need to find out if he is the answer. Personally he reminds me more of Shawn Marion (not a big man) then Amare Stoudemire (a big man). So the need for the off season is clear, a big man. Problem is, none are free agents, that leads to my second point. 2. Loul Deng will not be a first team all league player, ever. Don’t get me wrong, Deng is a nice player, but it shows that he didn’t pick up basketball until later in his life. He is not a fluid player and has horrible, horrible hands. For me he is the trade bait the Bulls need to use to get a big man. Tyrus Thomas takes his place as a number 3. Deng stock is high and I believe you could get Kevin Garnett for him and next year’s #1 (2008). Garrnett is from Chicago and would redo his contract to be on a winner. 3. I really like Ben Gordon, but he can’t be your number 1 scoring threat. I like him coming off the bench as an instant offense player. Plus his height can hurt in matchups. Jerry Stackhouse is a free agent and could be bigger guard who can score.